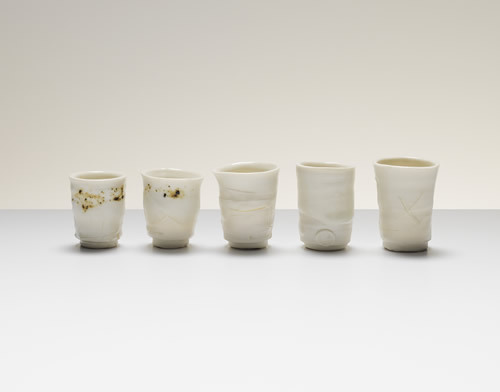 Galerie Besson is delighted to present an exhibition of new works by celebrated Japanese potter Ryoji Koie. 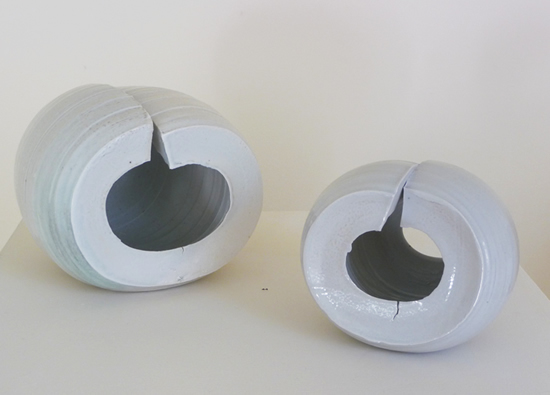 Invited by the Leach Pottery in St. Ives this June for a residency, Koie has produced an exciting body of work for this his 3rd solo exhibition at the gallery. 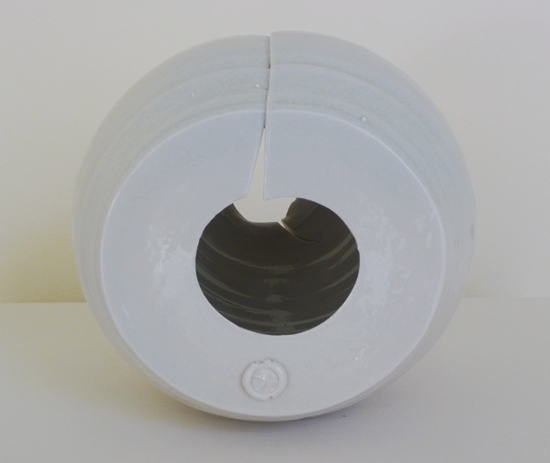 All the work will bear the artists signature, alongside the distinctive Leach Pottery seal. A curriculum vitae for Koie is available here. When Koie first came I apologised for the music coming from my room. “Good sound” was his reply and from then Chet Baker and John Coltrane joined his private soundtrack. 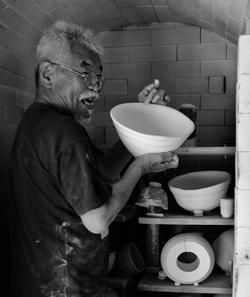 It was delightful to watch and listen to him work, the chawan dancing through his fingers and to see him gleefully break most of the rules in A Potters Book. We work in a new way in this old place, he was happy to join us and to use our clays and firings. 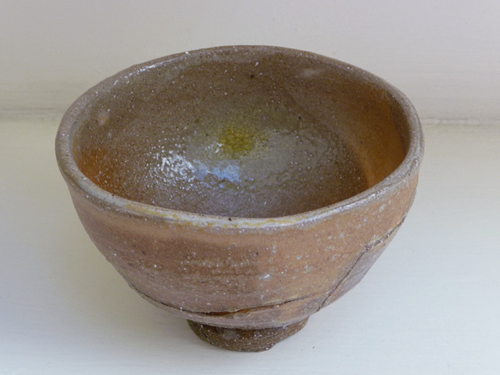 The stoneware clay is from St Agnes and is the old Leach standard ware body darkened with red iron. It is a real clay, gritty and rough. The porcelains are far more refined, one cold and icy white, the other warm like ivory. The Soda firing was new to him and he relished the opportunity to do it his way, packing the pots in the kiln upside down, balancing them on top of each other and perching them in the kiln flue. 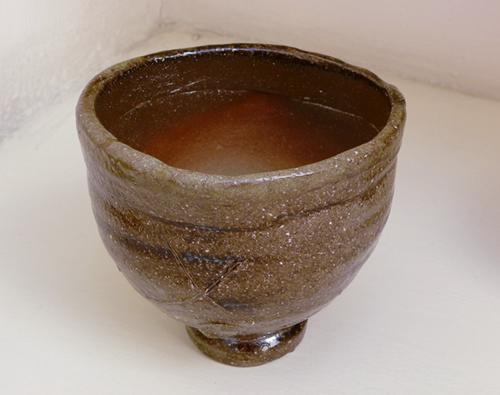 It is an elemental process, there is no glaze added to cover and hide the clay. A mixture of sodium bicarbonate and water is sprayed into the kiln at high temperature. The resulting vapour swirls through the kiln reacting with the silica in the clay body to produce a glaze where it touches the work. 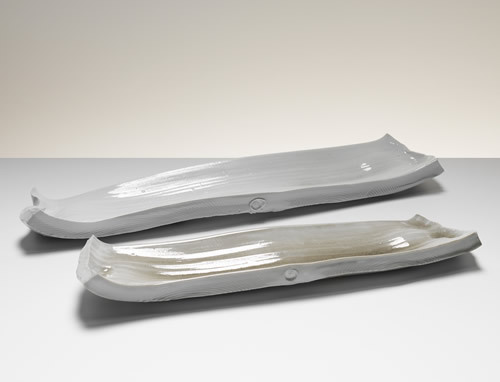 It has given these pieces an unselfconscious and graceful quality, completing a dance which began with clay and water. Looking across to the kilns, I see a large porcelain circle suspended in the branches of a tree. Koie will always leave his mark, on his pots, the people around him and the places where he works. 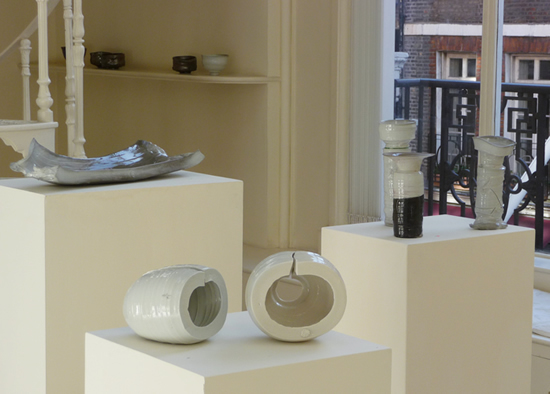 The Leach Pottery would like to thank the Great Britain Sasakawa Foundation, Jill Fanshawe Kato, Midori Endo, Kat Livesey, Anita, Matthew and Louisa at Galerie Besson and all the staff and volunteers at the Leach Pottery. 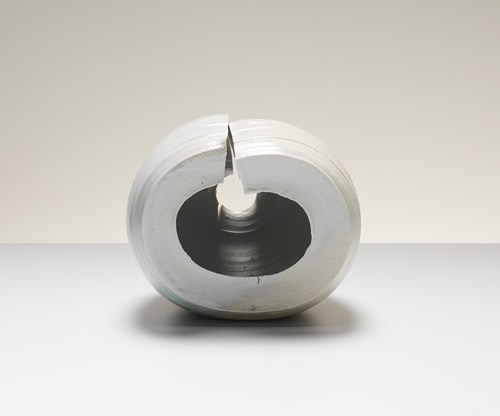 This is the third exhibition at Galerie Besson by Ryoji Koie, each resulting from a British residency. The first, twenty years ago, was to my studio at the time in Bentley near Farnham on the Surrey Hampshire border. 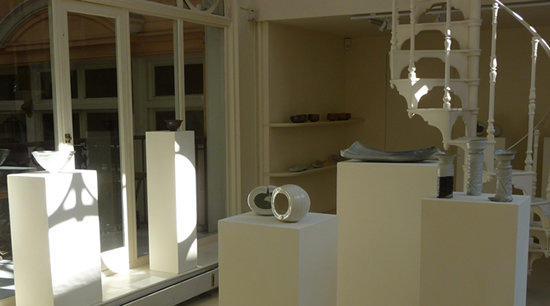 The second, ten years later, was at Margaret O’Rorke’s studio in Oxford. This year, his third working visit, was at the Leach pottery in an arrangement brokered by the British potter Jill Fanshawe Kato, who supported Koie in the exhausting role of translator and studio assistant. 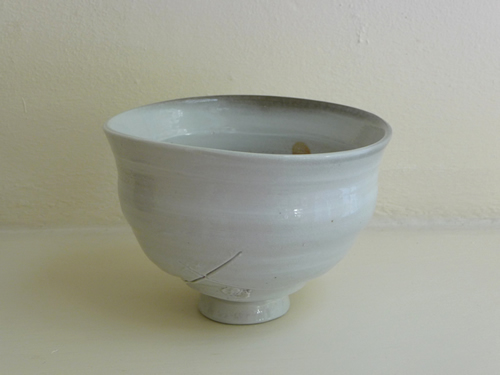 The establishment of the St Ives workshop by Bernard Leach and Shoji Hamada marked the beginning of a movement of studio pottery, deeply influenced by high-temperature Oriental folk pottery. It brought an aesthetic that the industrialised countries of the Occident and Australasia found refreshing. 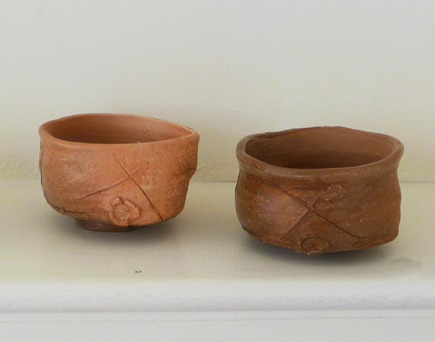 Although the arts and crafts movement and the writings of Roger Fry had prepared the ground, Leach introduced to the West a new way of appreciating pots; one that celebrated the organic, the asymmetric and the imperfect, where the marks of making can be openly ‘read’ on the finished work and are signifiers of honesty and the absence of pretension. Leach rejected the western privilege of the intellect and promoted the idea of a balance between head, hand and heart. 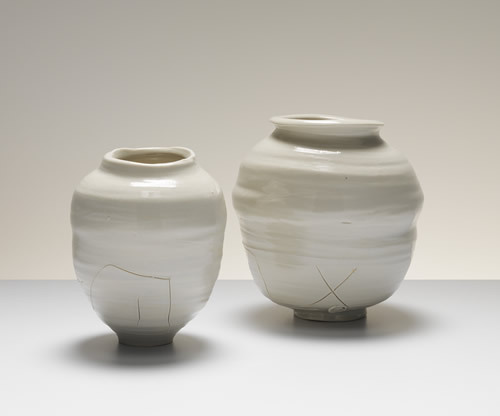 He believed that pots made by hand, if done with a humble heart, could be deeply expressive of what it is to be human, an idea that gained in appeal following the industrialised killings of the Second World War. 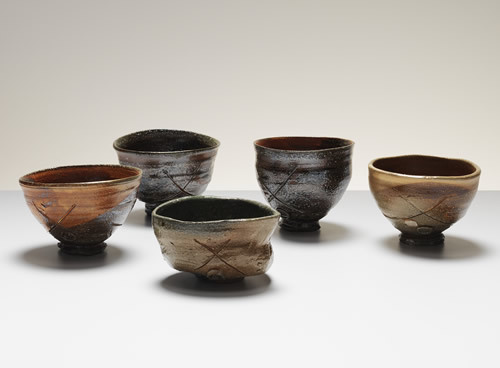 The continuing widespread respect and appreciation for Japanese craft in the West owes much to Leach and it is fitting that Koie should have used the St Ives workshop to make this body of work. However, this exhibition is no homage to the Leach philosophy. It has all the crazy energy and eccentricities of Koie’s other two Besson shows. It speaks of tension, play and drama rather than balance and quiet, no unknown wabi sabi craftsman steeped in tradition but a man possessed, living on instinct. Japan may be a country of ancient silent forests but it is also a land of fire and earthquakes swept by typhoons. 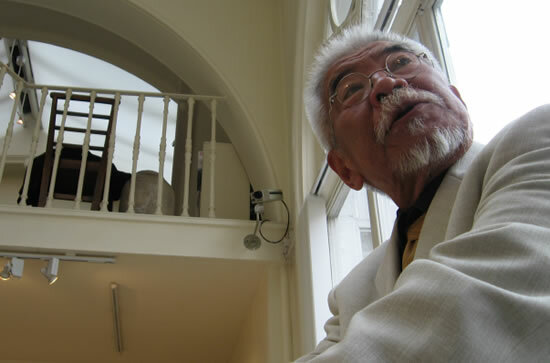 Koie is of a generation of artists that has had to reconcile themselves with the atomic bomb as well as the tea ceremony. Each Besson show of Koie’s work has its distinctive character reflecting the place it was made. At Bentley, an amazing black glaze called Devil Jumping was concocted with material gathered from an ironstone outcrop of similar name behind my home. In Oxford he worked exclusively in porcelain, as did his host. 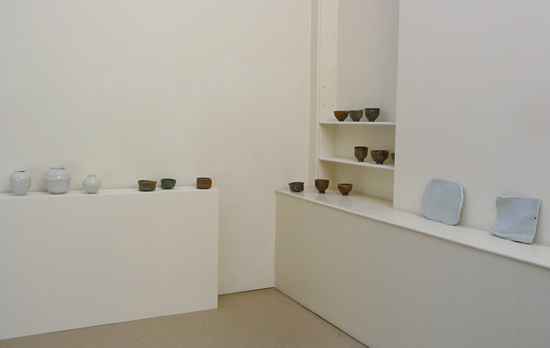 Koie embodied the place by impressing the soft pots with flowers from her garden. 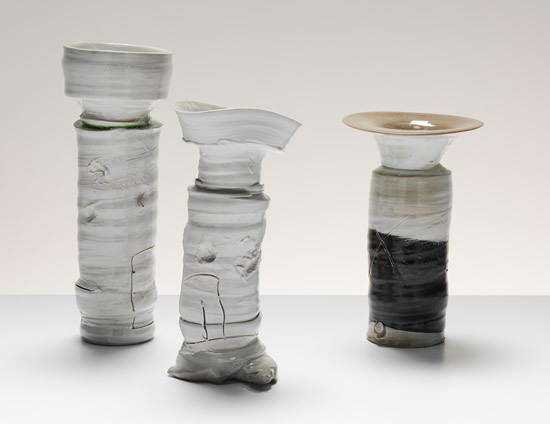 The St Ives work is made using the workshop’s standard porcelain and stoneware bodies and fired in their soda kiln, a firing process new for Koie. 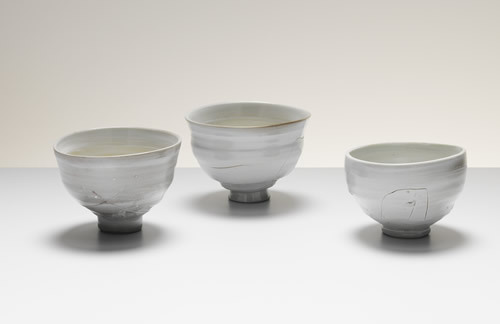 Many of the forms will be familiar to those who saw his other Besson shows: the ubiquitous teabowl and dishes made from thrown bottomless cylinders cut vertically and opened up dramatically so that the inside of the cylinder becomes the upper face of the dish. The soft variations of colour and texture that volatilised soda imparts bring new vigour to these forms. 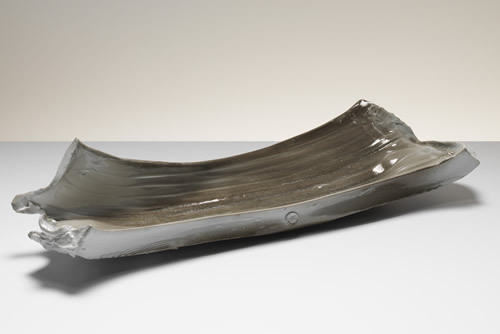 It is as if the work has been stripped of the clothes of conventional glaze to expose a naked body, sometimes soft, sometimes raw, cracked and bony, visceral. For me the development of digital art has given tactile practice a new imperitive; Koie’s work is an example of what this might be. The work speaks to, and of, the senses; all of them. It cannot be understood by the eye alone and rewards physical engagement. Conventions of taste and craftsmanship have long been discarded and the work is driven by a need to make and the joy of discovery. 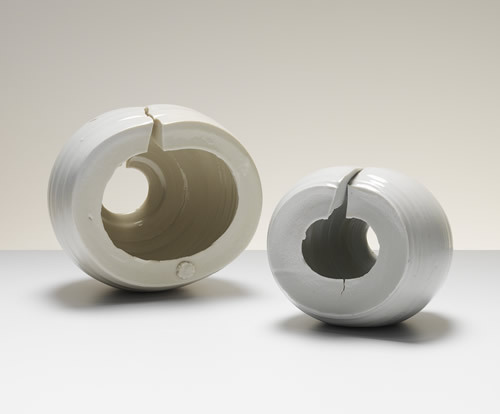 It is important to hold, to feel the work’s surface, shape, weight and its distribution for, as Natasha Daintry, a potter and former Japanese scholar, has written: “attending to the physicality of things has the effect of locating you in the world and connecting you to your own physicality”. 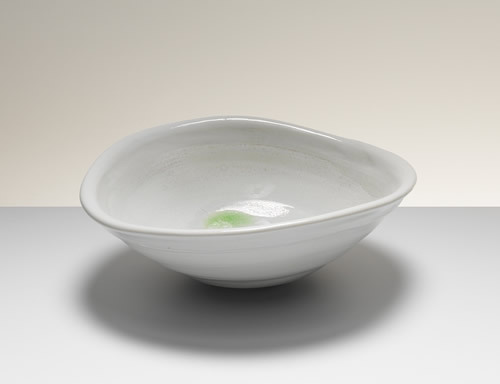 In 2001 Koie was awarded the prestigious Oribe award by the Gifu Prefecture. The award is named after the 16th century warrior and connoisseur who is associated with a creative surge in Japanese ceramics and a playful style of form and decoration. The award is to spread “Oribe-ism” – to provide a vital force that contributes to the development of creativity and imagination. Leach importantly encouraged interest in oriental aesthetics but with an almost religious doctrine that many ultimately found creatively stifling. Koie shows another relationship with tradition, something that is not restricted to Japan and may be found in many cultures. He imbues the clay with his generous, adventurous spirit, a vital force. On each of his three visits to Britain he has energised us with his Oribe-ism. 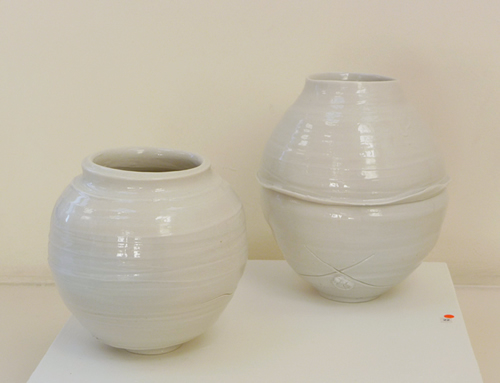 The pots in this exhibition are a lasting legacy of his presence. 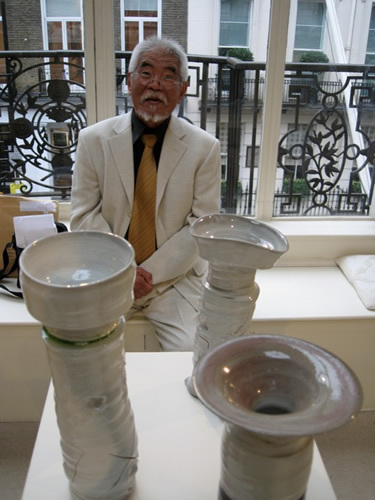 At age 72, ceramicist Ryoji Koie continues to set himself extraordinary challenges in work and life. Flying into another country and creating an exhibition with unknown clays and kilns in three weeks demands instant understanding of local materials and geology. Koie advises apprentices that to understand clay they should ‘have eyes not only in their fingernails but in their toenails too’ and his own communion with clay is total. His speed in making derives from his early training as a production thrower, but the pieces made are all one-off. New places act as a catalyst to his creativity and he has made exhibitions in countries as diverse as the USA, Spain, Australia and Israel. 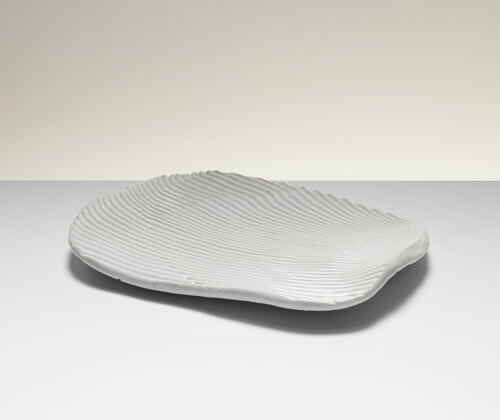 Koie’s creative leaps have taken him to the top of the Japanese ceramic world and also his influential international position, driven by his powerful personality and toughness. 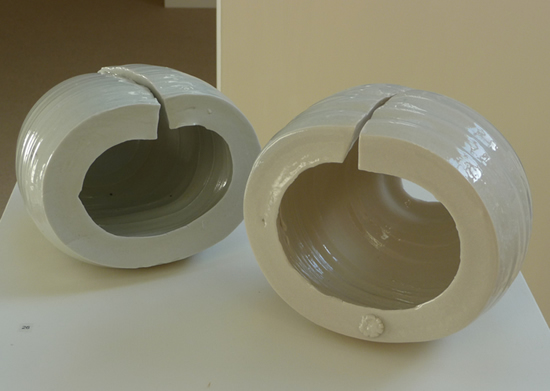 He has always challenged ceramic conventions, questioning ‘Why?’ or ‘Why not?’ or just saying ‘No’ to these unwritten codes. 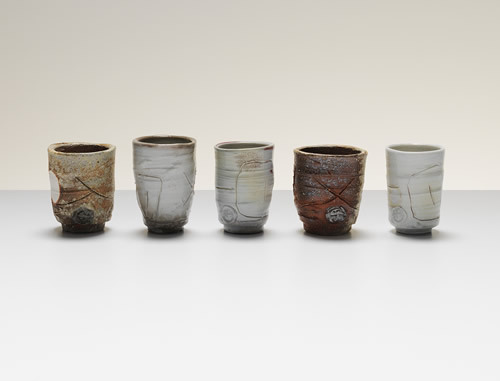 Having trained as a potter in Japan, I first met Koie at his Tokoname studio in 1984 and was subsequently invited to visit his new studio on a number of occasions when he generously let me use clays, glazes and kilns for my own exhibitions. 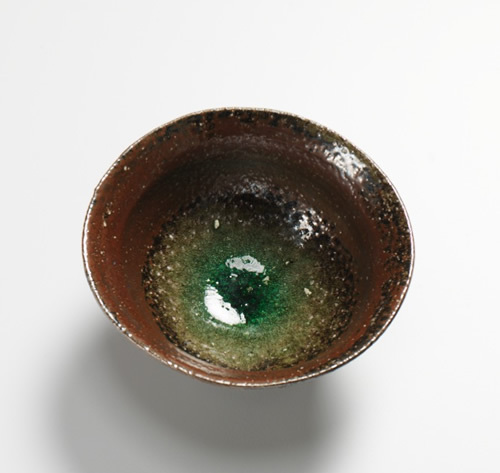 He was always experimenting with newly dug clays from the mountains, every process was in flux and change and the door of a roaring gas kiln was opened at 1240 degrees centigrade to remove ‘hikidashi’ black teabowls. Sometimes it felt like walking on thin ice. 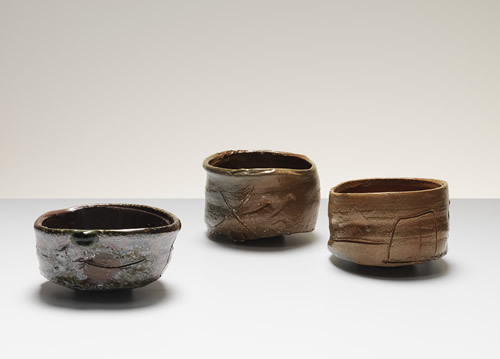 Despite still having three solo exhibitions a month in Japan, Koie relished the opportunity to make this exhibition for Galerie Besson at the Leach Pottery. 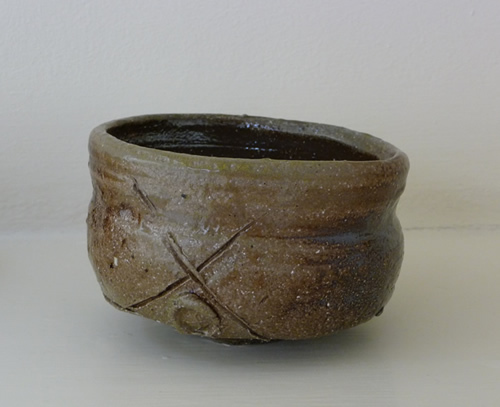 New to Cornwall and its landscapes, the ancient stone culture, dry stone walls, tin mines and the artistic heritage of St. Ives, Koie worked non-stop for 20 days, produced 250 pots and took on the challenge of soda firing for the first time. 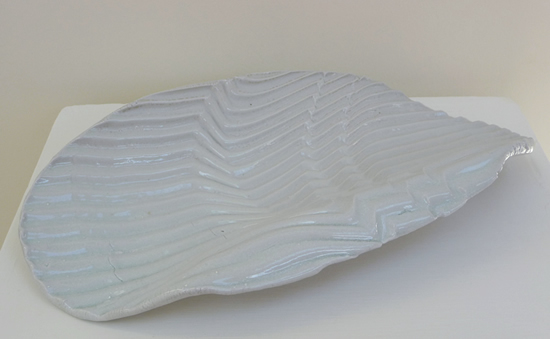 His involvement with clay was intuitive and the fluid ceramics made courtesy of the Leach Pottery are both soft and sharp, like the man himself. His advice to students ‘if you can make pottery your own, it will be yours for life’ is clearly followed in his own life. "The Japanese artist Koie Ryoji is famous for his 'volcanic' throwing technique. 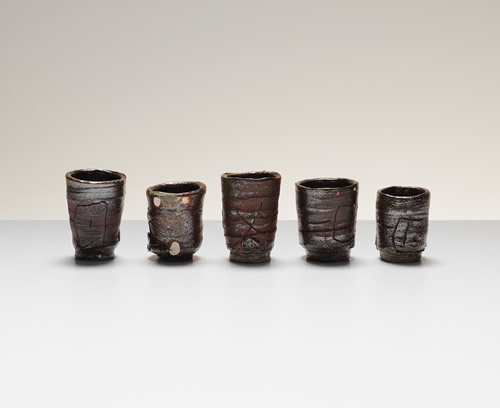 Come to watch him teaching this technique to five leading UK-based ceramicists, and enjoy this unique opportunity to see one of the world's foremost ceramicists at work". 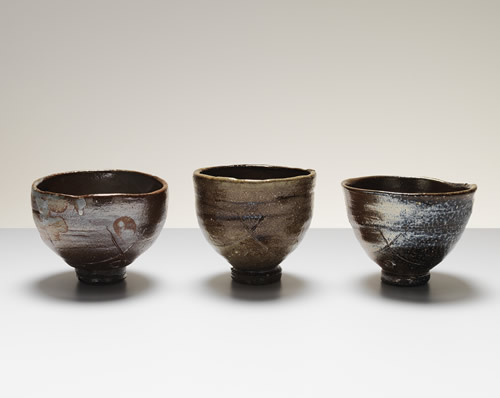 "The Ashmolean is delighted to be hosting a one day event for internationally celebrated Japanese potter, Ryoji Koie. 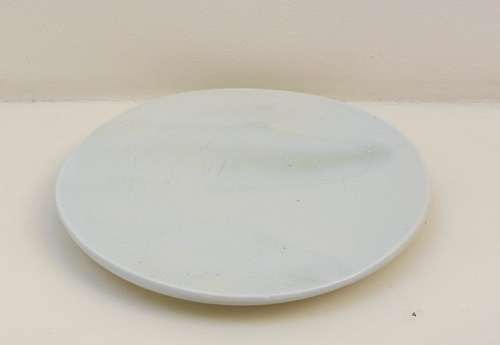 Koie recently spent 3 weeks at The Leach pottery, St. Ives producing work for his third exhibition at Galerie Besson, London. The day will start with film presentations showing his unprecedented adventures with clay and the Leach Pottery residency. This will be followed by a workshop in which he will be throwing, demonstrating and talking about the spirit within his working methods. The day will conclude with a discussion between Sebastian Blackie and Ryoji Koie (translated by Nobuo Okawa) in which they will consider the role of the clay artist today, both in the East and the West." 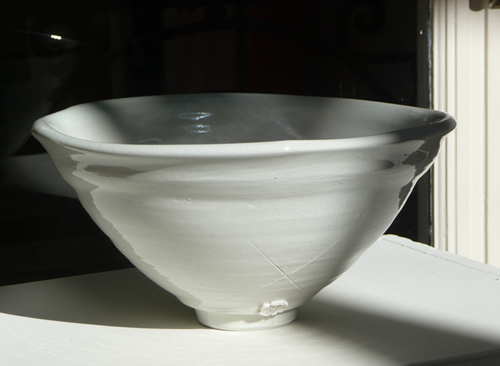 Watch a three minute extract from Christina Frewing's documentary video of Koie at the Leach Pottery, St Ives in June this year. The full length DVD is available to purchase from the gallery for £12.00 + P&P, please email us for details.